When did you peak? I ask the Secret Woman. He puts his pint on the counter and, contemplating the question, gazes at the line of gin bottles on the high shelf in front of us. - What? he says, 10 minutes later. - When did you peak? I ask again. - I heard a thing on the radio. - No, listen, I say, and I tell him about what I'd heard on Seán O'Rourke or Pat Kenny or Ciara Kelly - one of the programmes that accidentally keep me fit. I've said it before: I'm a shouter. I come from a line of men who shouted at the wireless. I stand in the kitchen and roar at the Roberts. A couple of months ago, the daughter showed me a yoke on my phone - an app - that counts the number of steps I take every day. That particular day, I'd taken more than 13,000 steps by the middle of the afternoon, even though I hadn't stepped out of the house. - You don't just shout, she explained. - You move up to the radio and back away from it when you're shouting, she told me. - Like a dog barking at another dog on the telly. So there you go: the radio is my gym. - Anyway, I tell the Secret Woman, - there's a new survey that says that we - humans, like - peak at the age of 68. - That's drivel, he says. - We're not 68 yet and look at the state of us. Actually, he's looking quite well. He seems to have done something with his eyebrows. Men of our age can be divided neatly into two groups, those with no eyebrows and those with too many - or, too much. But the Secret Woman doesn't fall into either of those categories. His eyebrows seem perfect; they're little works of art. The last time I saw eyebrows like them they were on Liz Taylor in Lassie Come Home. They might even be the same eyebrows. But anyway. - But there was a gang of people in the studio, I tell him. - They were all 68 and they were saying how great it is. - Where do they find these shams? the Secret Woman asks. - Well, if someone from a radio show phoned one of us and asked if we'd go on the show to declare how great it is being 68, we wouldn't do it, would we? - You wouldn't, he says. - Would you? - I would, yeah, I say. - Then I'd go on and tell the truth. - That being old is s***e.
It wouldn't be a surprise or a revelation; it would never knock Brexit off its perch. The gang on the radio - one of them said she went walking every day and she'd never felt better. Another of them said he'd done the Camino with a few of his friends. 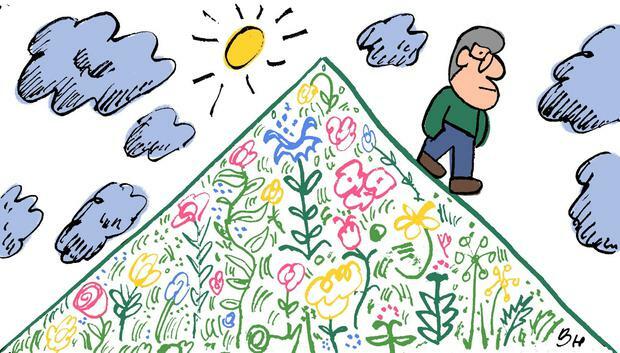 That's it, so: the highpoint of your life will be going for a walk. I look around at the other people in the pub. Half of them look like they were pushed here in shopping trolleys. There's a chap in the far corner, Buffalo Dec. He's always there; I've never seen him walking in or out. The only time he moves is when his moustache dips into his pint and he has to sit up straight. He's about 68, I'd say. So he's peaking away over there, all on his own, according to the aging survey I heard about on the radio. - What age were you? I ask the Secret Woman. - I remember it, he says. - My birthday. My father shook my hand. "You've reached double figures, son." His exact words. "I'm proud of you." - And that's the highpoint of your life? - Has it been downhill since then? I ask him. He's an intelligent man, the Secret Woman. I'm nervous about the answer. - Not at all, he says. - It's a load of b***ix. All that stuff about peaking and the best years of your life, and what have you. You just get on with it. There's good days and bad days, and great days and dreadful days. - And sometimes they're all in the same day. - There you go, he agrees. - Peaking, me hole. I turn on my stool and call over to Buffalo Dec.
We watch him hoisting his moustache out of his glass. - Did you ever do the Camino? I ask him. - I'll tell you now, says Dec. - I'd tarmac the f***in' Camino if it ever came near me. He hears the laughter burst out all around him, and sits up. He's surprised, and delighted. It's on his face: he's peaked.